Werewolf Natalya Stravinsky's outspoken sidekick, Aggie McClure, is featured in this prequel novella. Before Agatha set foot in South Toms River, New Jersey, she had the fight of her life to face. Destined to be the alpha female over her Manhattan pack, Aggie was fully prepared to take on her role until her father arranges a marriage without her consent. She wants out–but the only way is with money–something her new controlling husband won't give her to escape. But such odds never kept a wolf like Aggie down. To sever the twisted tie, she finds herself pitted against raging wood nymphs and backstabbing brownies in an underground supernatural fighting ring. With every victory, the sweet taste of freedom is closer, but her husband isn't willing to let her go that easily. Until the very end, Aggie must fight for the one thing she's never had: a choice. 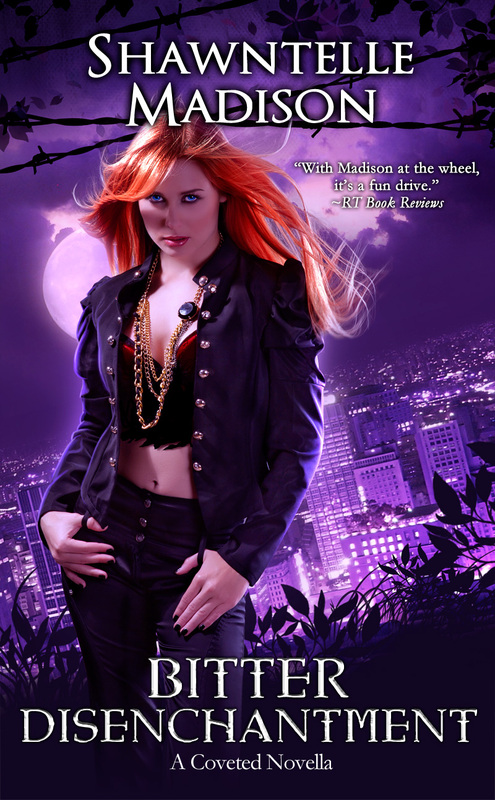 I have a new favorite Urban Fantasy author-Shawntelle Madison. I love the magical world she has created in the Coveted series and her characters all have big hearts, are strong yet vulnerable. I have to admit, I was a bit worried reading this one because while I liked Aggie as a best friend to Natayla, she wasn't one of my favorite characters in the series-she just annoyed me a little bit too much. However, that all changed with this book. I now love her! We learn in this books what secrets she has been keeping, and why she left the powerful pack she was a part of. Aggie is in a situation she hates-forced into a marriage of convenience by her father. I loved how she reacted to news about her wedding-she was furious, then got to know her husband to be a bit, started falling for him, then realized what an asshat he really was and instead of taking decided to do something about the situation. I liked it because it showed that she was a lot stronger then I gave her credit for in previous books, yet at the same time could totally feel for her situation and I so want her to have a happy ending now. I truly wouldn't mind a spin off series with her. This has everything I look for in a great novella: lovable characters, fast paced, and lots of action. I read this book almost in one sitting. Once I started it, I couldn't put it down. Shawntelle Madison is now an auto buy author for me!